AMG REVIEW: The largely electronic K7 neatly balances R. Stevie Moore's seemingly effortless ability to write catchy pop songs and his interest in minimalist synthesizer drones and tape collage. The latter interests predominate on this album, but unlike some of Moore's more experimental records, the instrumental and tape pieces on K7 are entirely accessible, often melodic, and uniformly intriguing. "The Crystal Chandelier" is a particularly nice mix of atmospheric synthesizer and a pretty pop tune. The dreamy "She's A Scream" and its more rocking doppelganger "Screamsman" are another pair of gems, but the album's standout is the hard-rocking "Pledge Your Money," a song Moore wrote for a fundraising week at his spiritual home base, New Jersey's freeform public radio station WFMU. 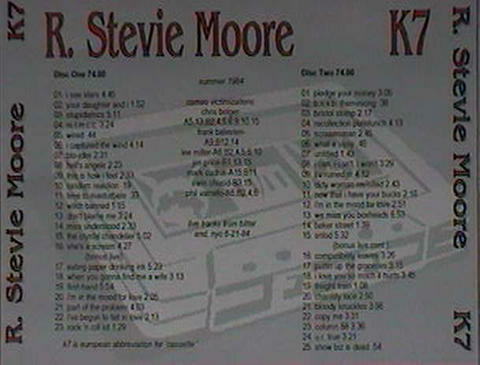 Added to the two-disc CD version of K7 (the title, incidentally, is a common European abbreviation for "cassette," combining the letter K with the French word for 7) is a previously unreleased live gig at New York City's showcase club the Bitter End, from June 21, 1984, featuring Moore backed by a pickup band of friends called the Biggest Names in Showbiz, featuring Lee Miller, Chris Bolger and Phil Varrallo. The band sound suits the songs, giving one man band tunes like "Bloody Knuckles" and "Copy Me" a little more punch. Highlights include the funky shuffle of the opening track "Eating Paper, Drinking Ink" and a rocking extended version of "First-Hand" with an impressive guitar solo.